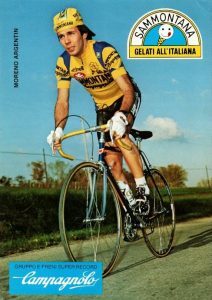 Sammontana is Italian icecream company founded in 1948, sponsoring Italian cycling teams since 1973. In 1982, the Sammontana team was led by Moreno Argentin and DeRosa was their bike suplier. 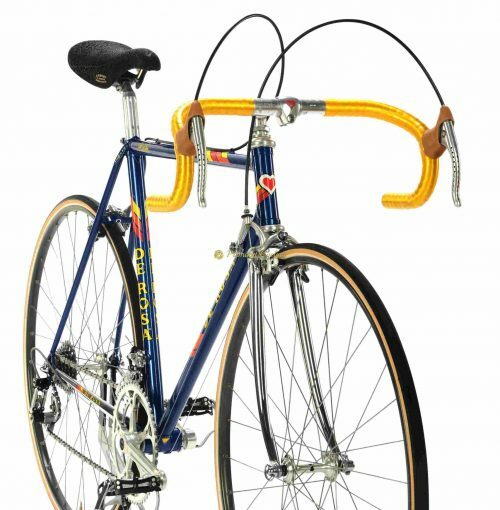 Here we are proudly presenting one the most iconic bikes made by UgoDe Rosa, the DE ROSA Professional. The frame is work of art, made of Columbus SLX, featuring the perfection and attention to details to providing the best performance you might expect from mid 80s racing machine. Amazing Team Sammontana paintjob, famous ”Diamante chainstay” , De Rosa engraved seatstays, complete Campagnolo Super Record groupset with pantograph DE ROSA Cinelli cockpit, Mavic GP4 rims and Superleggeri Titanium pedals. No much words needed. Iconic and very collectible. L’Eroica ready. Fair price. Condition: The frame was completely rechromed and refubrished by professional guy. No cracks, no dents, not bent. Groupset and wheelset are in excellent condition.